Coconut water, also referred to as coconut juice, contains vitamins, minerals and electrolytes. It is fat-free and naturally sweet. Coconut water comes from the young, green coconut. As the coconut matures, the water is absorbed into the white meat, and liquid can be extracted from the white meat to consume as a beverage. Coconuts are native to the Pacific Islands and Asia. Potassium is an essential electrolyte needed for daily functioning. It regulates your water level so you do not become dehydrated or retain water. As an electrolyte, potassium conducts electrical impulses for nerve conduction, heart contraction and skeletal muscle flexibility. A 1-cup serving of coconut water contains 600 milligrams of potassium in coconut water, lists USDA National Nutrient Database. The recommended daily allowance is 4,700 milligrams, making a 1-cup serving of coconut water almost 13 percent of the RDA, according to the Linus Pauling Institute. Coconut water is considered a sport drink because of it contains many nutrients lost in physical exertion and sweating. It is marketed as an isotonic beverage, which means that concentration levels of nutrients are the same as in human blood. As a result, coconut water is absorbed readily into the body and can prevent dehydration after a workout. Potassium is used up with physical activity in addition to being excreted in sweat and needs to be replaced after exercising. A vigorous workout that lasts for two hours or more may result in a loss of 300 to 800 milligrams of potassium, according to USA Today. One to 1 1/2 cups of coconut water will help replace the potassium lost. Read More: Should You Exercise If You Are Dehydrated? Having too much potassium in the blood is called hyperkalemia, and having too little is hypokalemia. 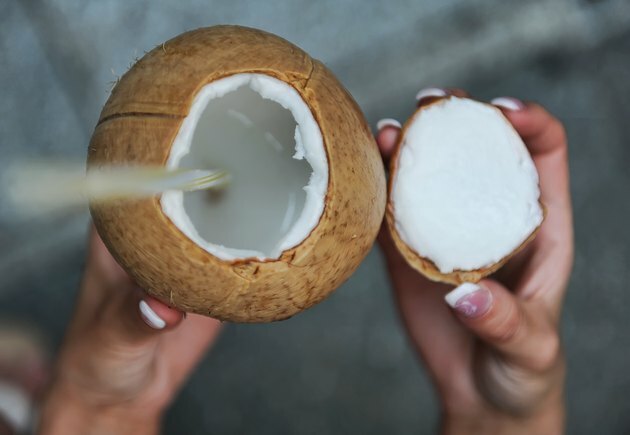 Drinking one or two servings of coconut water per day, along with a balanced diet, can help prevent hypokalemia, according to Linus Pauling Institute. Potassium deficiencies manifest in symptoms of fatigue, nausea and muscle cramps, while too much potassium can cause irregular heartbeat, temporary paralysis and tingling of the hands and feet. You can receive the benefits of coconut water in canned varieties or from an actual coconut. The potassium in coconut water can support cardiovascular health. The Linus Pauling Institute reports that adequate levels of natural potassium intake result in a lower risk of experiencing a stroke. In addition, potassium in coconut water may support healthy blood pressure levels. Coconut water should not be used as a replacement for blood pressure medications or potassium prescribed by your healthcare provider.